(Gloucester Township, NJ) – The powerful nor’easter storm system that has moved up the East Coast this week is now bringing snow and wind to Camden County. 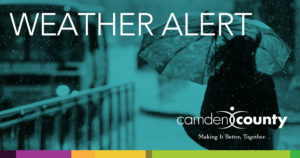 Based on the strength of this winter weather event classes at Camden County College have been cancelled, and the Camden County Animal Shelter and Camden County Library System will close for the remainder of the day. All other Camden County offices and departments have also been closed. Freeholder Susan Shin Angulo, liaison to the public works department, said crews have been working since early this morning and that plow trucks are operating in all 12 winter weather districts. Public works crews are treating more than 1,200 lane miles of county road battling the blizzard like conditions with 100 pieces of equipment. In addition to the county plowing operation the Code Blue remains in effect and warming centers and shelters are open today and later into the week until the deep freeze breaks.